Why Choose Te Atatu South Childcare? 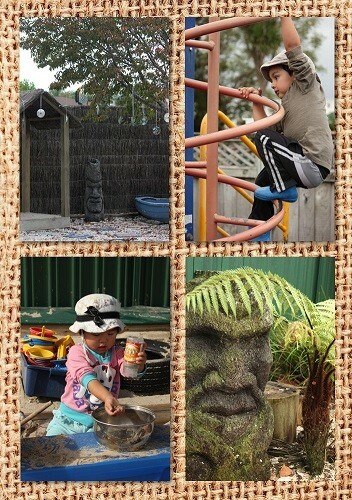 Opened in 1993, Te Atatu South Childcare is family based and privately owned early childhood centre in Auckland. We are big enough to provide a wide range of experiences to develop your child’s potential, but small enough to know each and every child – and their family. Our Centre has been operated by the same management team since opening. At Te Atatu South Childcare Centre, we believe that, through everyday experiences, the tamariki will develop social competencies which will support them in future learning success. We value that the early years/childhood is a crucial period for this to evolve. Partnerships between the centre and whānau will help each child achieve a sense of belonging within the centre. We value that time spent through open communication and interaction will build positive, reciprocal relationships and friendships between tamariki, kaiako, parents and whānau and the wider community. We provide a rich learning environment where kaiako work and learn together to support each child’s holistic development. As tamariki play and interact with their peers and kaiako they will be provided with a wide range of options and experiences to explore throughout their day. Tamariki will have time to speak and to be listened to. The tamariki will be empowered to be competent, capable learners. We believe our environment is inclusive of all people, and is emotionally and physically safe. We believe that when tamariki are treated with honesty, respect and dignity, they will become trusting and responsible individuals. We will provide a stable nurturing environment that allows the tamariki to develop their over all well-being. We believe that continuity of care is essential to the children’s development. These are the elements of our philosophy which we believe have made us a reliable member of the community and provider of childcare in West Auckland. We have a strong, dedicated teaching team that have been together for a number of years. Our teachers are experienced in behavioural management and our teachers have experience with children who have special needs.Our child care centre caters for children from babies to school age. Our opening hours are from 7.30 AM to 5.45 PM. Though licensed for 50 children, on average we have 10 under 2’s and 35 2 to 5-year-olds. We have three separate learning environments divided by gates, not doors, so siblings are able to see each other throughout the day if they wish. We employ a full-time cook who provides morning and afternoon tea as well as a nutritious healthy cooked lunch containing one starch, one protein, and at least four vegetables. Special diets are easily catered for, whether it is for medical or cultural reasons. Children who are over 4 years old have lunch box days which helps them prepare for eating independently at school. A booking fee of $50 is required when enrolling your child. This will secure your child’s space. Once your child starts, this fee will be returned as part of the first week’s fees. Please note that a minimum of 2 days per week for under 3s and 3 days per week for over 3s must be booked. Once enrolled and a start date has been given, all days will be charged for regardless of whether your child attends or not. You are buying the days booked, not paying for the attendance of your child. Automatic payment or internet banking are our preferred methods of payment. When setting up your automatic payment, please use your child’s reference number (we will advise you of this) in your payment reference.Fees are to be paid weekly in advance. WINZ childcare subsidies are available to assist with fee payment depending on your family income level. Please talk to the manager about this. Any balance of your child’s fee not covered by WINZ must be paid by parents. Full fees will be charged until the centre receives the WINZ subsidy. If your child is going to be absent, please contact the Centre to advise us prior to 9.00am.All statutory holidays and absences from the Centre are to be paid for. Make-up days are available if your enrolled day falls on a statutory holiday day. Our close-down period, from the 24th December until January, will not incur any fees. We provide subsidised fees for all our 3 and 4 year old children. If you are going to be late picking up your child, please phone to advise us. Otherwise, you could incur a late fee which is charged at $1 per minute, after our specified closing time of 5.45 PM, and $2 per minute after 6 PM. Fees are subject to change and may be increased at any time at the discretion of the Centre. We will give at least two weeks notice of any fee increase. If you are wanting to enrol your child at Te Atatu South Childcare, please download the enrolment form below and bring it with you when you come to visit.